Lexington Theological Seminary has introduced technology into its online classes that allows students and faculty to interact via video and audio. The Kentucky institution is running Internet MegaMeeting's Professional edition of its video and Web conferencing application, which participants tap into via a browser. Each student is required to have a computer with a Webcam. On his or her browser window the other people in the class show up in video boxes with audio. The program lets the instructor show PowerPoint slides, and a noteboard application lets faculty post questions for the students. Besides audio, the application also allows for text chat. According to Benjamin Wyatt, educational technologist and instructional designer at the seminary, the adoption of the service was a result of wanting to help online classes develop a sense of community. Lexington Theological has set up several online communities in its learning management system, Edvance 360, such as one that allows students to talk freely about courses and professors without staff intervention. But the use of MegaMeeting has taken that relationship building to a new level, he said. For example, MegaMeeting allowed online professors to hold the same kind of "icebreaker" session in the first class that's standard in many face-to-face classes. "In the long run it makes the discussion boards that much more effective and powerful, because students within the online courses have had that meeting upfront," he explained. "They're more inclined to share more information than they would have if they hadn't had that introductory meeting via the virtual room." Image courtesy of Benjamin Wyatt. To help students collaborate on group projects, he has set up three virtual rooms available 24/7 to enable them to meet with each other and work on their assignments. Wyatt said he likes how the program lets the students see the professor. "You don't get that in many online programs," he pointed out. "And you have opportunity to discuss articles, readings, things you don't understand. In a typical online course, you'd have to do that via e-mail." The monthly conferencing plan that Wyatt uses provides for a 25-person capacity, 16 with audio and video, and nine with only audio. That costs $225 per month. Currently, only two faculty members are using the program. But two more will start using it in December, Wyatt said. "Then that number will increase as we move forward," he added. Wyatt believes that adoption of MegaMeeting will help broaden support for online teaching among those instructors who are hesitant to try it. "Those faculty tend to like the face to face classes," he said. "This type of tool goes hand in hand with that. 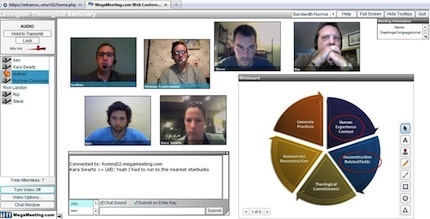 MegaMeeting gives them the opportunity to see and hear the students in their course."